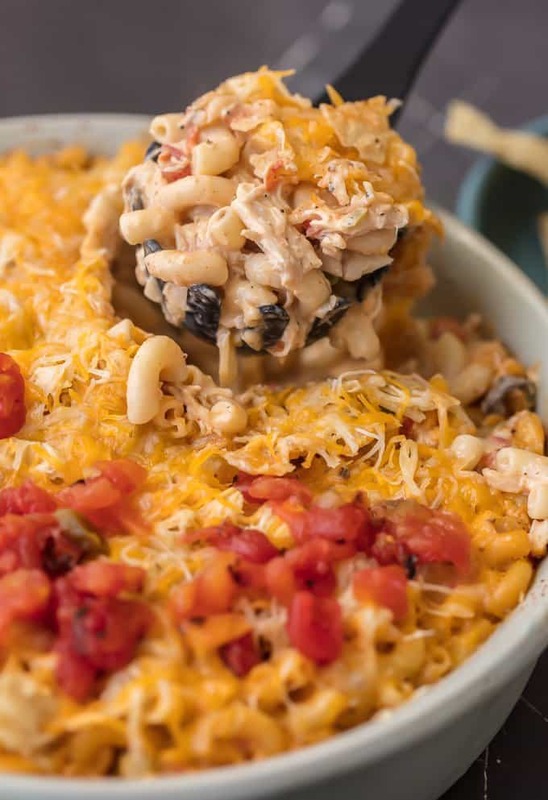 KING RANCH CHICKEN MAC AND CHEESE is a delicious twist on a classic. I wanted to make a fun King Ranch Chicken Recipe that’s filled with all those amazing ingredients that I love. 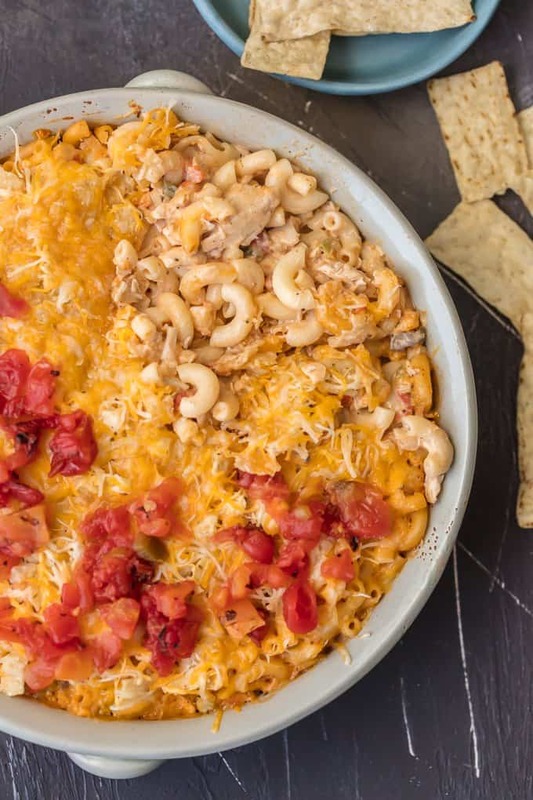 This Chicken Mac and Cheese Casserole is loaded with creamy cheese, spicy tomatoes, chunky chicken, and so much more. 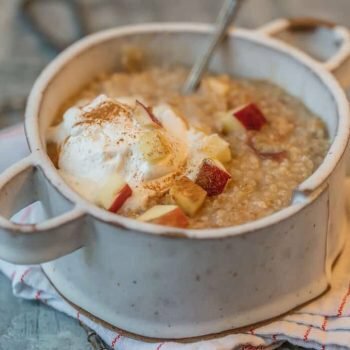 It will be a family favorite from the first time you make it. King Ranch Chicken Mac and Cheese is so creamy and delicious. You’re going to love this fun King Ranch Chicken Recipe! KING RANCH CHICKEN MAC AND CHEESE makes me soooo happy (and fat)! I just know you’re going to love this fun and tasty King Ranch Chicken Recipe as much as we do. Growing up, King Ranch Chicken was one of the recipes we would request Mom make time and time again. I just love the creaminess, the creative flavor combo, and that little touch of spiciness. Haters of King Ranch Chicken like to complain that it has Velveeta (check) and cream of mushroom soup (check check) but you guys…sometimes that’s okay. I want you to embrace it! The Velveeta makes this Chicken Mac and Cheese EXTRA cheesy with minimal effort, and the canned cream of mushroom really is okay with me. I’m not the girl who is going to make homemade cream of mushroom soup (at least not for this recipe). If you know this blog…then you already know that by now. So let’s go ahead and just enjoy this King Ranch Chicken Mac and Cheese because it’s AMAZING and oh so crave worthy. No guilt here folks! 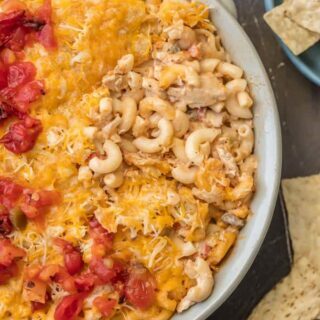 You’re going to love this flavorful King Ranch Chicken Mac and Cheese. It’s creamy, cheese, and sooo delicious! King Ranch Chicken is kind of an unspoken classic. 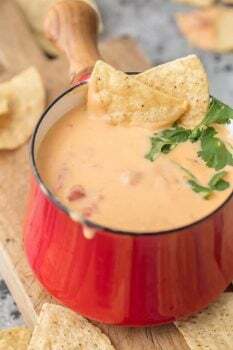 The mix of ingredients make the most amazing flavor, and I thought it would be fun to use this combination to make a new King Ranch Chicken Recipe. We’re mixing up all those ingredients along with macaroni pasta to make a tasty Chicken Mac and Cheese casserole! 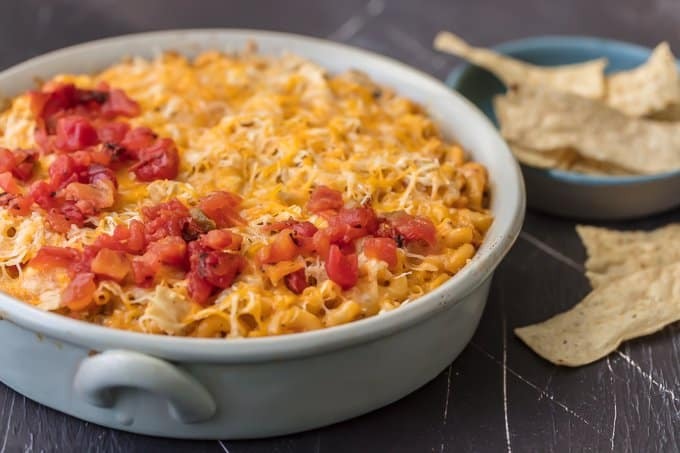 Traditional King Ranch Chicken recipes have bits of tortillas baked in, so I thought it would be fun to add a layer of crushed tortilla chips while baking this chicken mac and cheese. The little bit of crunch and texture goes a long way. This recipe was a hit even when I tasted it still cold (yes I have been known to do that). But of course it was even more delicious straight out of the oven. Winner winner King Ranch Chicken Mac and Cheese dinner! This King Ranch Chicken recipe is just too good. There’s sooo much cheese, and it’s all so creamy. Classic Mac and cheese is good on it’s own, but of course it’s even better this way! 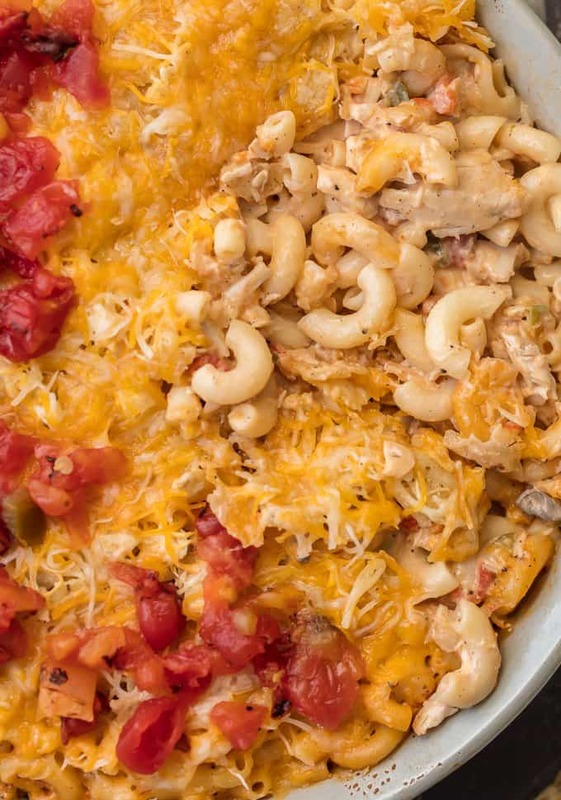 This Chicken Mac and Cheese Casserole is filled with all the most delicious ingredients, and baking them together in a casserole dish just adds so much flavor. I can’t get enough of the creaminess that the mushroom soup adds. You really can’t go wrong with a Chicken Mac and Cheese recipe. What are you waiting for? 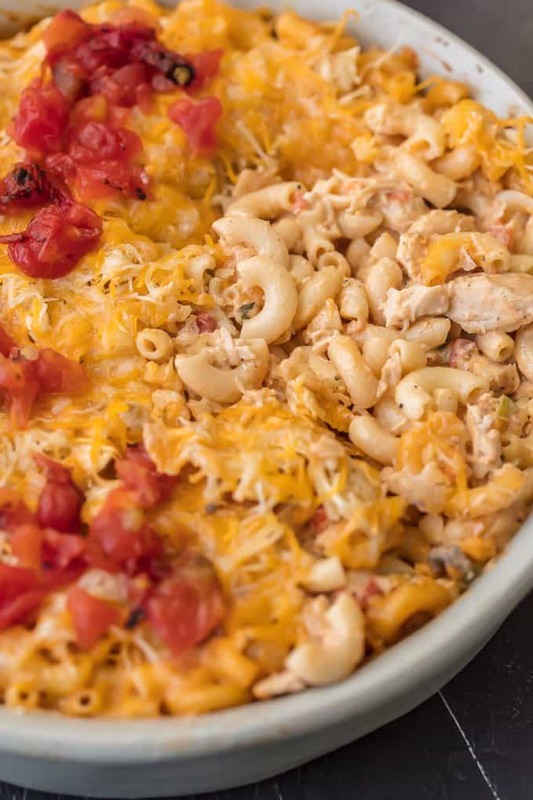 This King Ranch Chicken Mac and Cheese will absolutely blow you away! This creative King Ranch Chicken recipe is filled with so much goodness, I just can’t get enough. See the recipe card below for details on how to make King Ranch Chicken Mac and Cheese. Enjoy! KING RANCH CHICKEN MAC AND CHEESE is a delicious twist on a classic. I wanted to make a fun King Ranch Chicken Recipe that's filled with all those amazing ingredients that I love. 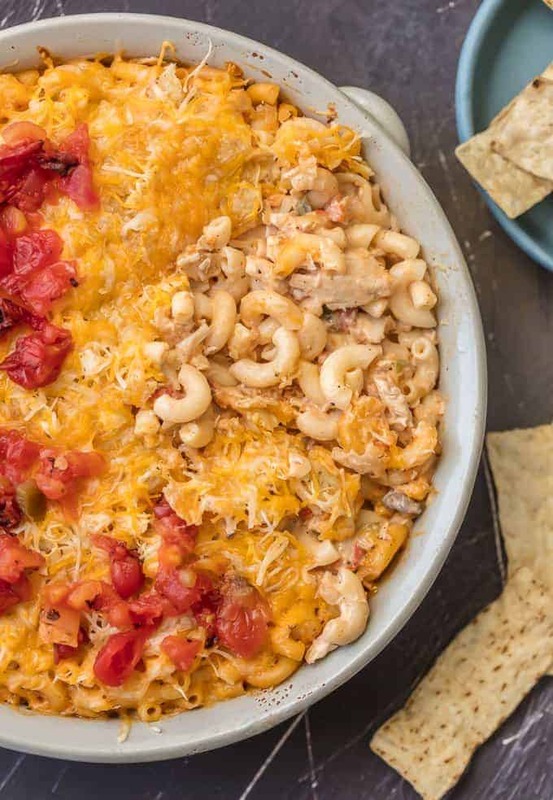 This Chicken Mac and Cheese Casserole is loaded with creamy cheese, spicy tomatoes, chunky chicken, and so much more. It will be a family favorite from the first time you make it. 10.5 ounces cream of mushroom soup click for recipe! Preheat oven to 350°F. Spray a 2-quart baking dish with cooking spray. Cook pasta per package directions to al dente and drain. While pasta cooks, heat butter and oil in a large Dutch oven, over med-high heat. Sauté onion and green bell pepper until pepper is tender and onion is translucent. Stir in the undrained can of tomatoes, Velveeta, chili powder and cumin. Cook and stir 1-2 minutes over medium-low heat until cheese melts. Remove from heat and add the creamed soup, sour cream, chicken, 1-cup shredded cheese and strained hot pasta. Stir well. Pour the prepared pasta mixture into the greased casserole dish. Cover with crushed tortilla chips. Sprinkle 1-cup shredded cheese on top and bake at 350°F 30-40 minutes or until casserole is bubbly in the middle. Remove from oven and allow the casserole to rest 5 minutes. If desired, garnish with drained green-chili tomatoes, chopped cilantro and more crushed tortilla chips.